The macaque monkeys of Phuket Safari Eco+ Park in Thailand might look like they are having the time of their lives. They get to ride tricycles, listen and dance to music, and when they want to wind down, they can have a bit of a workout. But if you haven't guessed already, they are doing none of these things by choice. When the tourists arrive, the music starts and the macaques enter the pavilion with metal chains around their necks along with their trainers. With a quick yank of the chain, the monkeys start to perform and any pretense of fun completely disappears. Any astute animal lover can tell that these animals are suffering. The monkeys have a tight schedule and they are forced to perform throughout the day, but when they do get a "break," they are stuffed in tiny metal cages backstage. The cages have no food or water, and they are left to sit in boredom until their next show. But the macaques aren't the only animals suffering at the park. Phuket Safari also has mature and baby elephants, snakes, sheep and other domesticated animals that they force to perform at the whim of paying clientele. Parks like Phuket Safari are technically illegal. In 2014 the Thai government passed its first ever animal welfare law but it is rarely enforced. If the government doesn't work to shut down these horrible facilities, animals will continue to suffer and Thailand will continue to be known as a country that turns the other way when it comes to animal cruelty. 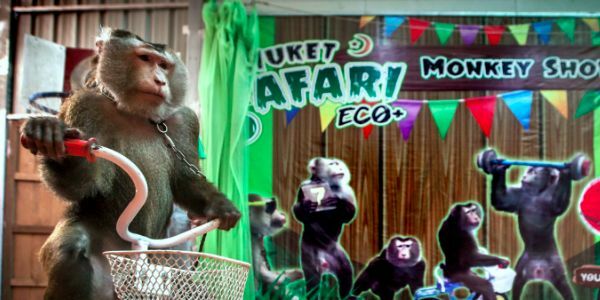 Tell Thailand to enforce their animal welfare laws but shutting down Phuket Safari Eco+ and sending these animals to sanctuary! Sign the petition and help make a difference.